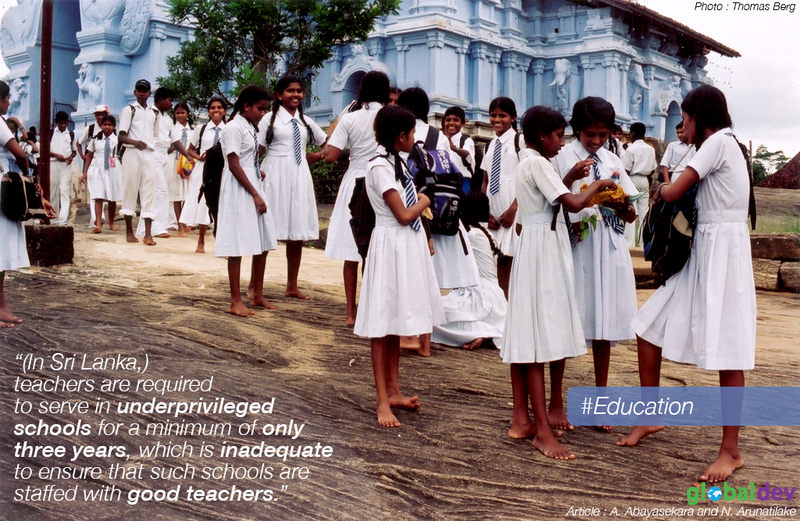 Sri Lanka has a shortage of qualified and experienced teachers, largely because of issues with training, recruitment, and deployment. This column suggests that educational policymakers should upgrade pre-service teacher training programs, both in terms of subject and pedagogical knowledge. It is also essential to conduct systematic teacher recruitment, and improve the allocation of teachers so that schools in disadvantaged parts of the country can benefit from having good teachers. The World Bank’s latest Year in Review: 2017 in 12 Charts rightly notes that “human capital – the skills, experience, and effort of a population – is the world’s greatest asset.” In Sri Lanka, the 2018 Budget proposals also acknowledge the importance of human capital for sustained economic growth. They propose several measures to improve the quality of education, especially in science, technology, engineering, and mathematics (STEM). Good performance at Sri Lanka’s General Certificate of Education (GCE) Ordinary Level (O-Level) exam is a prerequisite for most further education courses, including the GCE Advanced Level (A-Level) exam and many vocational training programs. But, according to the country’s Ministry of Education (MOE), in 2015, 45% of students either failed or only conditionally passed their O-Levels due to failing mathematics. The average share of students qualifying to continue to A-Level classes was also low, at 41%. Our research shows that, among other factors, Sri Lankan schools that have higher shares of qualified and experienced teachers of mathematics report better O-Level results. We also find that while the country has no overall shortage of teachers of mathematics and science, there is a significant deficit of both qualified and experienced teachers (Figure 1). This is a cause for deep concern, particularly in light of Sri Lanka’s goal to improve STEM education. We also find that teachers are not distributed equally across different types of school. As Figure 2 shows, privileged schools have more than enough teachers of mathematics, a majority of whom are qualified to teach the subject. On the other hand, disadvantaged schools face teacher shortages and account for a lower share of competent teachers. The limited opportunities for pre-service teacher training constitute a key reason behind the shortage of qualified and experienced teachers in Sri Lanka. Such training is available via two avenues: a Bachelor of Education (BEd), offered by university faculties and departments of education; and a three-year National Diploma in Teaching (NDT) offered by National Colleges of Education (NCOEs). A study of teacher education reveals that only two of the 17 state universities offer a BEd, producing a negligible 135 graduates annually. The NCOEs produce around 3,350 diploma-holders. These numbers are considerably lower than the annual number of teacher recruits needed in the country, which average at around 8,000 per year (Figure 3). Figure 3 also shows that recruitment is carried out in an unsystematic manner, with large teacher numbers recruited in some years and lower numbers in others. Moreover, teachers are rarely well matched to their education and training at recruitment. Of the total number of teachers joining teacher service in 2016, only a fraction was subject-qualified – see Figure 4. The teacher deployment system does not ensure a fair distribution of teachers across schools. Teachers are required to serve in underprivileged schools for a minimum of only three years, which is inadequate to ensure that such schools are staffed with good teachers. Furthermore, according to the teacher education study, some teachers use political and other influences to avoid getting placements in disadvantaged schools. The first ambition should be to upgrade and improve pre-service teacher training programs in the country to meet the demand for qualified teachers, both in terms of subject and pedagogical knowledge. For this to happen, either the number of faculties and departments of education in Sri Lankan universities need to be expanded, or the NCOEs need to be developed to the university level. The second ambition should be to conduct systematic teacher recruitment, where subject knowledge and training of teachers is taken into consideration when filling vacancies. As done in developed countries, teachers should be given a formal certification to teach a particular subject according to their qualifications and training, based on which recruitments can take place. The third ambition should be to improve teacher allocation by providing sufficient financial and other incentives to attract and retain high-quality teachers in disadvantaged schools. Formally recognizing teaching in difficult schools in the progression of the teaching career path is also important. Ashani Abayasekara is a Research Officer at the Institute of Policy Studies of Sri Lanka. She holds a Masters in International and Development Economics from the Australian National University. Nisha Arunatilake is Director of Research at the Institute of Policy Studies of Sri Lanka, and heads the Labour, Employment and Human Resource Development unit.